After what seems a long Winter, Summer is on its way, which means it’s time to get out and have fun in the great outdoors. Building on last year’s award-winning Little Trikers Challenge, Little Tikes is once again encouraging parents to enjoy adventures with their family by getting out and about with their Little Tikes’ Trike. Hoping to inspire you, they’re working with five families to show you how exciting adventures look like from your little ones’ perspective and offering you the chance to go on an adventure with your own Little Triker by winning one of 20 trikes! Launching on 22nd April, you’ll be able to find out more and join in at www.facebook.com/littletikesuk. When families go shopping, out for a stroll or embark on day trips, little ones can sometimes be sat in their stroller for hours often leaving them bored or tired. Little Tikes want to make life out and about, from the age of 9-36 months, a little more fun by challenging parents to swap their strollers for a Little Tikes Trike this summer and create a nation of Little Trikers on mini adventures! To launch the initiative, Little Tikes have challenged five families to undertake their very own stroller swap by using a Trike instead of their pushchair, and commissioned five videos of their little one’s adventures along the way! Check these out at www.facebook.com/littletikesuk. Now they’re ready to challenge the rest of the UK! Across their social media channels the UK’s number one outdoor toy brand is offering everyone the chance to win one of 20 Trikes to go on their very own Little Trikers adventure! All you need to do to be in with the chance of winning is to share your family fun days with the Little Tikes Team by posting videos or photos to the Facebook page. The competition runs until Bank Holiday Monday 2nd May and the winners, chosen at random, will be announced on Tuesday 3rd May. The must-have Trike for you and your little’s adventures is the new 5-in-1 Deluxe Ride & Relax® Recliner Trike from Little Tikes. Growing with your child from 9 months to 3 years+, it helps them learn how to ride, steer and finally pedal. The ‘perfect fit’ technology design allows the trike to not only adjust to three different positions but to recline too, so after all that adventuring your tired Triker can take a comfy nap! 1. The Guided Stage: 9+ months. Push your little one along with the footrest down and safety harness in place. 2. The Learning Stage: 12+ months. You’re still in control as your child learns to pedal and understand speed control. 3. The Developing Stage: 18+ months. The Trike is child-and-parent powered! Your youngster can pedal, while you stay in control. 4. The Independent Stage: 30+ months. The guide handle is removed and your child gains confidence, coordination and skill under their own steam. 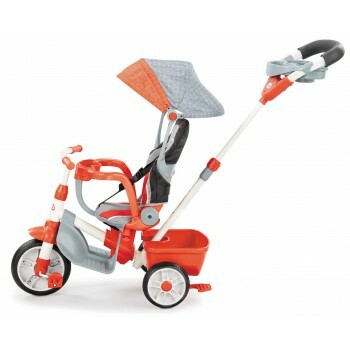 You can check out the brand new Trikes’ section of the Little Tikes website at www.littletikes.co.uk, plus get some adventure inspiration through their Top Triker Trails here: http://www.littletikes.co.uk/top-triker-trails. So what are you waiting for? Get your Little Triker on board and get triking! The adventure awaits!